Kills 99.9% of bacteria. Ready to use liquid.5x better than bleach* *On removing limescale and rust. Harpic 100% Limescale Remover has been specifically designed to dissolve 100% of limescale and kill 99.9% of bacteria in your toilet bowl. The unique formula gives you better bowl coverage so you can ensure your toilet is left thoroughly clean and disinfected. Ready to use liquid. Instructions We recommend you wear gloves while you disinfect and clean your toilet. 1. Lift up the toilet seat and carefully direct the nozzle under the toilet rim. 2. Squeeze the bottle and apply slowly all around the inside of the bowl, allowing enough liquid to cover the bowl completely. 3. For optimum cleaning results, leave for 10 minutes, flush and brush. 4. To disinfect, leave for 60 minutes, flush and brush. Wash hands and exposed skin before meals and after use. Do not use with any bleaches or other cleaning products. Keep tightly closed. To remove cap: 1. Squeeze the pads on the sides of the cap and unscrew. To replace cap: 1. Screw on tightly. Safe in your septic tank. Suitable for all toilet bows. Precautions Toilet Bowl Cleaner<br>DANGER. 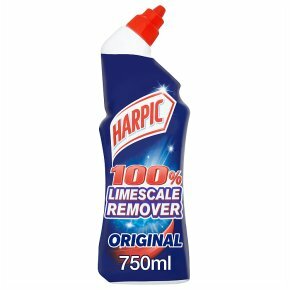 HARPIC 100% Limescale Remover Original.<br>Contains Hydrochloric Acid. Causes severe skin burns and eye damage.<br>May be corrosive to metals.<br>Harmful to aquatic life with long lasting effects.<br>Keep out of reach of children.<br>IF SWALLOWED: Rinse mouth.<br>Do not induce vomiting. Immediately call a doctor.<br>IF INHALED: Remove person to fresh air and keep comfortable for breathing.<br>IF IN EYES: Rinse cautiously with water for several minutes. Remove contact lenses, if present and easy to do. Continue rinsing.<br>Avoid release to the environment.<br>Dispose of contents/container in accordance with local/regional regulations.